Ok, we are a few days into 2012 now, but I've been going through photos taken last year on my adventures, and thought I would put some of them together on here to piece together my movements for you. There will be a lot of foodporn, and plenty of dishes from a man called Rene. 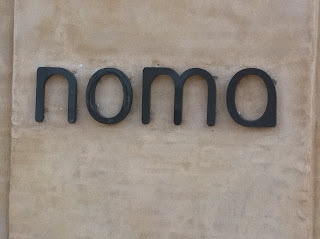 I made two pilgrimages to Noma, Rene Redzepi's world famous 'best restaurant in the world' (according to the San Pellegrino/ Restaurant magazine list-the trophy is shown above) and both were stunning occasions. The first was a last minute thing, a friend called me to ask if I wanted to fill a space on his table there as someone else had dropped out. You dont turn down that sort of invitation, so I tagged along. Noma is so much more than the food, its an ethos and a way of thinking, which the whole team, front of house and back, subscribe to. The food is boundary pushing stuff, what used to be called avant garde, and has been emulated to varying degrees by chefs all over the world. Above is a 'dish' we were served on my second visit there (my birthday dinner-worse ways to spend it!) 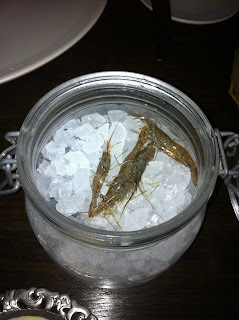 of live shrimp, which we were invited to eat in a single bite after dipping the wriggly blighter in a brown butter emulsion-like a warm mayonnaise. it was both incredibly fresh and startlingly full of flavour. One of my stand out meals from the U.K. last year was the Ledbury, Brett Graham's Notting Hill two Michelin starred restaurant. 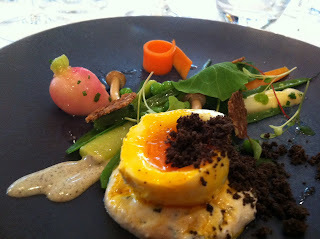 the above is one of the highlights from that lunch- salad of spring vegetables, morel curd, warm hen's egg. Stunning use of the freshest vegetables, tasty free range egg and an intense morel curd. One of the up and coming chefs who I was lucky enough to meet and eat the food of, was Matt Gillan, the chef of The Pass at South Lodge Hotel. 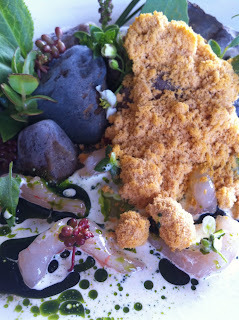 When I visited, I was treated to some new dishes He and his team had been experimenting with. Lots of flavour packed dishes, none more so than this crab orzo dish with charred corn and truffle 'glass'. the crab orzo (rice shaped pasta) was served warm, like an uncoated arancini, and the taste was stunning. Read about the rest of the meal here. In April, this unlikely looking kitchen brigade was the team I was presented with by Raglan Primary School, to mentor in their cookery competition for their 'food festival'. They were a rowdy bunch, but they had some good ideas, and plenty of passion. 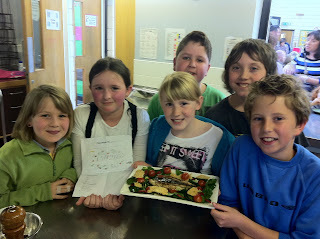 Their final dish was a salad of mackerel with dried tomatoes, Parmesan crisps and balsamic vinegar dressing. The following month, I did a brief tour of the south west, part of which included the Caterer magazine's 'chef eats out' event at Nathan Outlaw's two Michelin starred restaurant in St Enedoc, Cornwall. Nathan's food is very clean, deceptively simple looking, and very tasty. 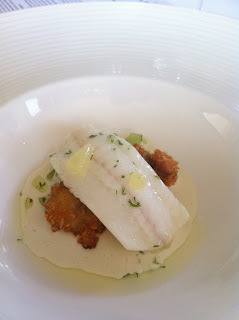 The above is 'lemon sole, oyster, horseradish and cucumber'. deep fried oyster, which was huge, with a lightly steamed sole fillet, with a delicate horseradish cream, and salted cucumber. Nathan has a book coming out this year, and if this dish is any indicator, it will be some book. Glynn Purnell is only 34, but seems to have been at the forefront of British food for a long time. His eponymous restaurant in Birmingham has held a Michelin star for several years, and I ate there twice this year. 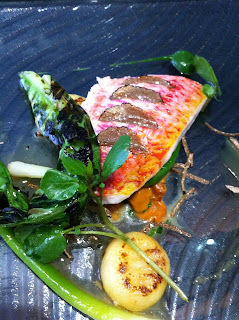 Of both visits, I think the truffle stuffed red mullet with truffle gnocchi and grilled lettuce was a highlight. Sweet girolles finished the ensemble. Of the London restaurants which I visited, Apsleys at the Lanesborough hotel (run by Heinz Beck) was probably one of the glitziest in decor. 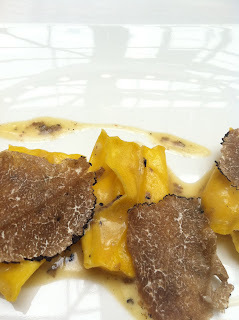 It also yielded my favourite pasta dish of the year, the truffle and Parmesan agnolotti above. A liquid truffle sauce wrapped in delicate golden pasta parcels, lavished with shaved truffle, and twenty four month aged Parmesan. Very potent, but very more-ish. On the same day I went to Apsleys, I also made my first call into Roganic, Simon Rogan's first entry into london (his other restaurants are in Cartmel, Cumbria. The food at Roganic is mainly vegetable led, with plenty of innovative methods and presentations to enhance them. 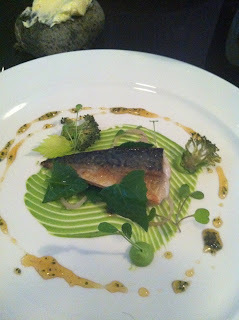 The seawater cured mackerel, broccolli and warm elderflower honey showcases that style. A lovely dish. 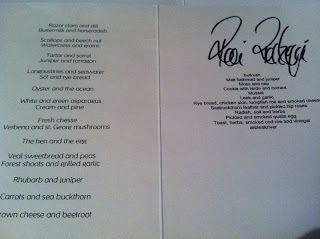 I had to slip in my menu from Noma, signed by the man himself, Rene Redzepi. Another restaurant we visited in Copenhagen, was 'the Paul', run by an Englishman, Paul Cunningham. Using the Scandinavian philosophy, and vast Danish Larder, Paul was awarded a Michelin star for his quirky restaurant. the pigeon, white asparagus and cocoa nib jus was startlingly good, very moist bird, full of flavour, and a great course of a great meal. One of several (over50) courses from my trips to Noma which also stood out was this plate of raw shrimp, dehydrated sea urchin, coastal herbs and herb oil. The ingredients were not only amazingly fresh and vibrant, but all sourced from the same beach, including the pebbles which were frozen to the plate to help create the seaside feel. Brilliant. Relae is another of Copenhagen's eateries, run by an ex-Noma sous chef and waiter team. It is in a slightly seedier part of town, in a subterranean shabby chic room. 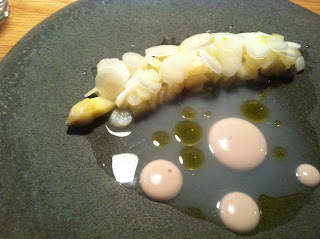 This was raw and cooked white asparagus, asparagus juice and oyster emulsion. Once again, the Danish ingredients were top notch, and treated with respect. A much more relaxed affair than Noma, but just as accomplished on the food front. Dont just take my word for it, we met David Chang of momofuku restaurant group there, and he said when he visits Copenhagen, which is often, he always goes to Relae. The last of the dishes from Noma to make this list is the mussel snack, or canapé. 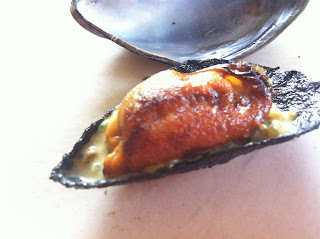 It looks simple enough, but the steamed mussel sits on a stew of leeks, and an edible shell made of squid ink. a real 'wow' moment near the start of the exciting Noma experience. 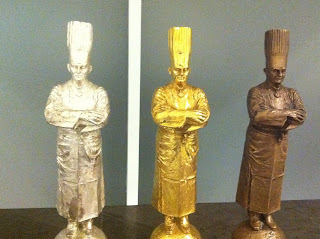 The Final restaurant we visited in Denmark was Geranium, run by Rasmus Kofoed, who won gold in last years Bocuse D'or competition, after finishing in second and third places in previous years-his three trophies are at the top of this post. Much of the food at geranium was more refined than Noma's in many ways, and there is the same level of thought and research gone into the dishes. A prime example of this was the tastes and textures of milk. 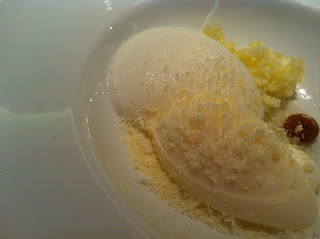 sorbet, caramel, ice cream, mousse and powder were all prepared with great technique and effort, to create a milk dessert which showcased different elements of the ingredients complex flavour. the powder was even sprinkled on at our table, from a cardboard milk carton. great theatre, and a great dish. A simpler, but just as satisfyingly tasty meal was served to me at Marcus Bean's pub, the New Inn, Baschurch in shropshire. 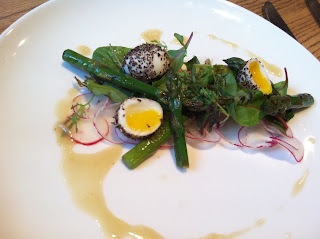 Local ingredients are once again the key, and all all of this salad of asparagus, radish, herbs and quail eggs come from the local area. Totally fresh, and cooked with care and precision, I loved Marcus's food. Anyone who reads this blog regularly will know of my respect and admiration for Grant Achatz of restarant Alinea in Chicago. 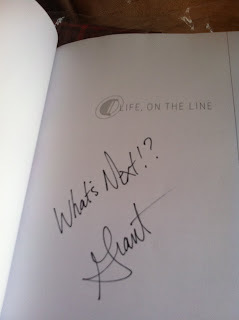 This year, He released a book about his life so far, called 'a life, on the line'. Its a stunning insight into what made him push to get to his current position, as the leader of gastronomy in the U.S.A., and one of the best chefs in the world. As a regular user of a chefs website called The Staff Canteen, I entered, and won a competition on there to win a signed copy of that book. 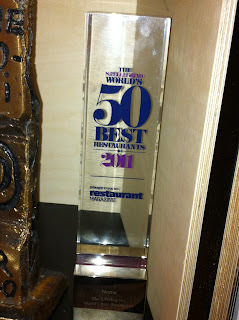 It is now a prized possession, tucked safely away with my signed menu from when I ate there in 2010. 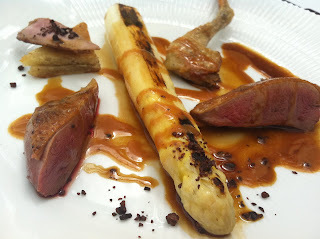 The last two great meals I had in 2011 came on the same day in December, when I re-visited Roganic, and dropped in at a newly opened restaurant in the Westbury hotel, run by Alyn Williams, previously head chef at Marcus Wareing. Both meals were stunning, the highlight of my meal at Alyn's is pictured above left, in the rather blurry phone shot. 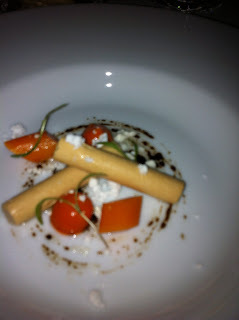 Its a foie gras parfait, with frozen yoghurt, sand carrot, and liquorice, and I can only describe it as sensational. the textures and flavour worked in unison to blow me away. The rest of the meal was equally brilliant, and Alyn Williams at the Westbury has a bright future. 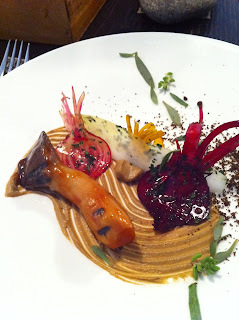 The picture next to it is poached and grilled king oyster mushroom, with pickled beetroot, from Roganic. Ben Spalding had really raised his game in the six months between my visits, and this dish was certainly among the best. A great way to end the year for me. So, that's it for my 2011. I had more meals than these, obviously, and just because the other places I dined at aren't featured here, doesn't mean I didn't enjoy them! I hope you will all come back regularly to see what adventures 2012 holds for me. As James Knappett said at the all-stars event, "food is love, keep eating!" All the best, and a Belated happy new year!